What Are the Best House Plants for Beginners? Caring for plants successfully can be tricky. There are thousands of different house plants to choose from, and each requires their own unique care routine. Luckily, there are several plants you don’t need to be an expert gardener to care for. To help you kickstart your indoor foliage endeavor, these are the best house plants for beginners and those with a developing green thumb! Check the soil moisture: Stick a finger one inch into the plant’s soil. If it’s dry, water it. If it’s still moist, let it be. Tip: Succulents and cacti require less water than most plants, so check soil moisture at least up to two inches before watering. Look at the Leaves: Leaves that are browning around the edges, curling up or turning translucent are signs your plant needs watering. Additionally, all plants need light. Some plants need lots of direct sunlight, while others can prefer indirect light or even shadows (You can read more about that here). By rule of thumb, flowering plants generally need more light, while plants with thicker, fleshier leaves do well with less light. Additionally, cacti and succulents often thrive in bright, direct sunlight; however, with the right amount of watering, soil and humidity, most plants can survive without ideal lighting conditions. 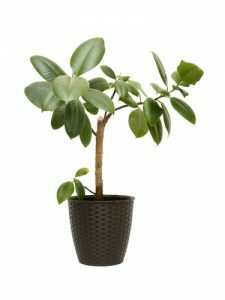 Plant size: When you first buy a plant, choose a pot around the same size or slightly bigger than the pot it came in. Too small of a pot will require more watering, and a plant that is too big for its pot will easily tip over and suffer from stunted growth. A pot that is too big for your plant will have a harder time draining and can result in root rot. Watering Needs: Most indoor plants need pots that allow excess water to drain and air to flow into the soil. Most often, these pots are terra cotta or plastic with drain holes in the bottom. Plants usually need to be repotted when they outgrow the pots they are in. HGTV recommends repotting plants in the spring, when root growth is most abundant. When repotting, select a new pot that is 2-4 inches larger than the pot your plant is currently in, use fresh soil and water the plant well. For plants you don’t want to grow larger or those too big to repot, simply prune new growth, trim the roots and add fresh soil for nutrients. Ready to start your own garden filled with house plants for beginners? Check out our indoor plants! This entry was posted in Flower Care and tagged Flower Care, house plants, houseplants, plant care. Bookmark the permalink.